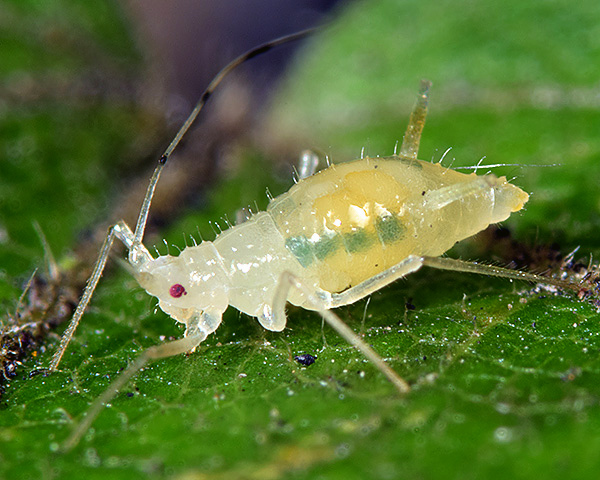 Immature Drepanosiphum aceris (see first picture below) are a very pale green, usually with darker green patches down each side of the abdomen and between the siphunculi All adult viviparae are alate. 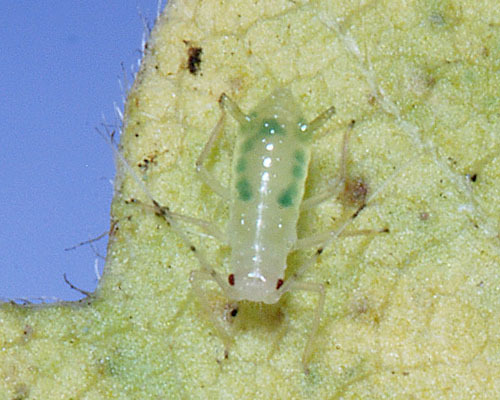 Adult females are yellowish or pale whitish-green with brown thoracic lobes. At the apex of the forewing membrane there is a dusky cloud (see second picture below) (cf. Drepanosiphum dixoni, which never has a dusky cloud at the apex of the forewing membrane). There is another (less clear) dark patch at the outer end of the pterostigma. There are often rather narrow cross-bands on abdominal tergites 4 and 5 (see third picture below) (cf. Drepanosiphum platanoidis which never has dark bands across abdominal tergites 4-5 only). Drepanosiphum aceris also usually have lateral spots in front of their siphuncular bases. The siphunculi are dusky (not black) at least distally. The body length is 2.7-4.2 mm. The micrograph below shows a Drepanosiphum aceris alate dorsal in alcohol. 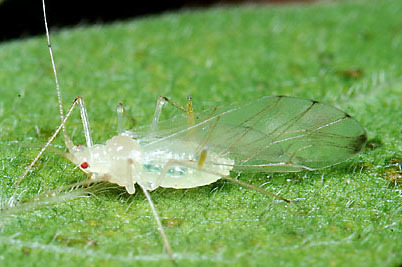 The scarce maple aphid lives on field maple (Acer campestre), usually under leaves near ground. Sexual forms occur in September-November. Drepanosiphum aceris is distributed throughout Europe and east to the Caucasus. 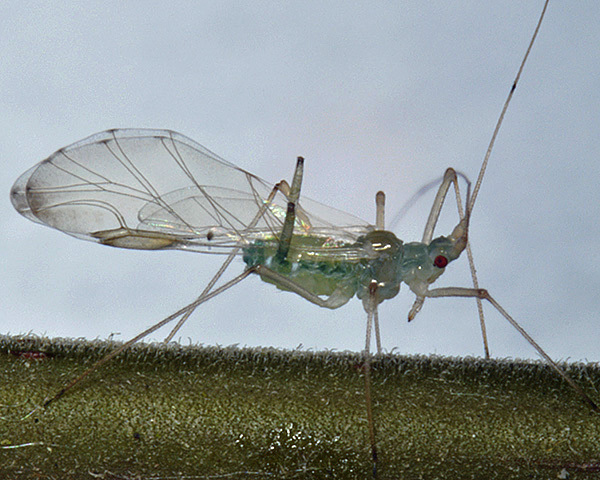 The overwintering eggs of the scarce maple aphid laid the previous autumn on twigs and branches hatch in spring, and the aphids develop in compact colonies. 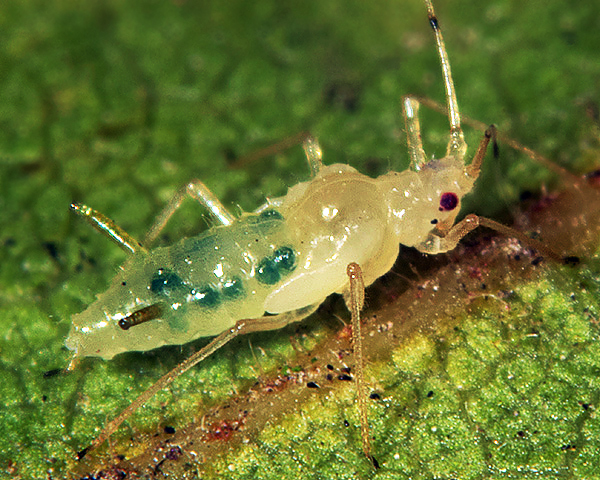 The image below shows a third instar nymph with the developing cross bands bright green at this stage. 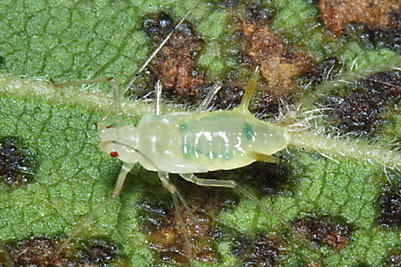 The first image below shows an alatiform (winged-form) fourth instar nymph of Drepanosiphum aceris. The second image above shows a teneral (recently moulted) alate which lacks any dark markings. The image below shows a mature adult alate with the black cross bands clearly visible. The alate below has been feeding recently, and has just extruded a drop of honeydew. Sexual forms develop in the autumn. The oviparae (see picture below) have variable dorsal pigmentation, with dark bands sometimes present on thoracic and first 5 abdominal tergites. 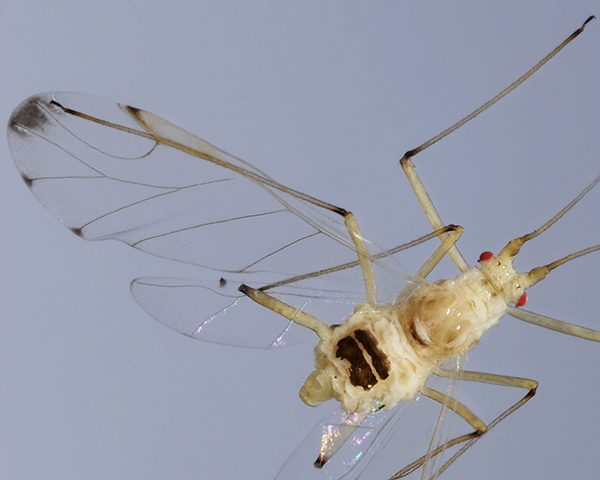 The abdomen behind the siphunculi is produced into an ovipositor-like extension, the posterior tergites being being either wholly membranous or with small individual hair-bearing scleroites. 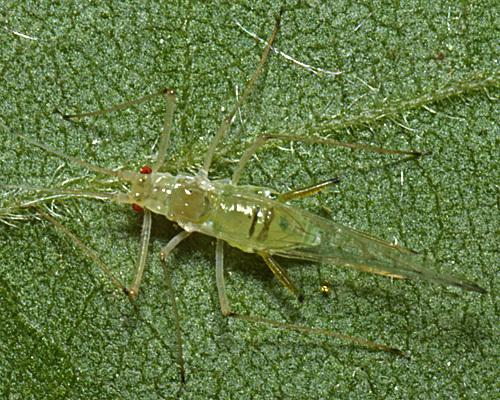 Males are winged, although some may be brachypterous (see picture below). 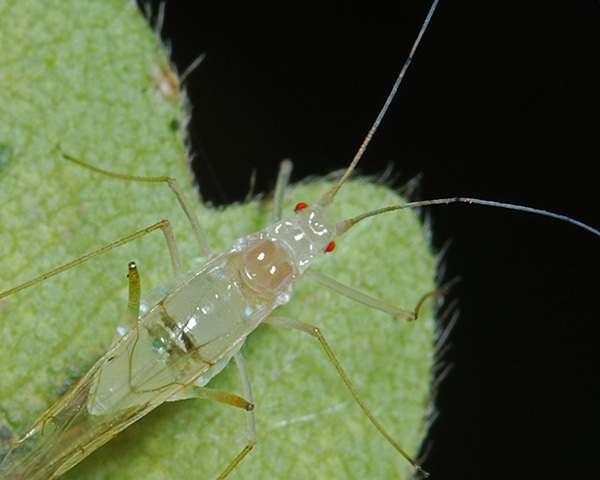 There seem to be few records of predators and parasitoids apart from Wiackowski et al. (2001) who recorded Aphidius rosae as a parasitoid of this species. 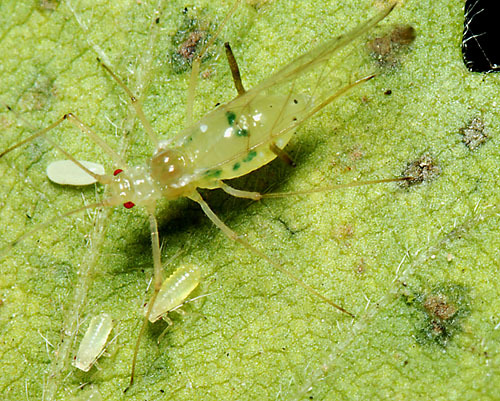 They are certainly predated by syrphid larvae, as shown by the syrphid egg found with an alate vivipara of Drepanosiphum aceris and two young nymphs shown below. The close-up below shows the characteristric microsculpture of syrphid eggs. Drepanosiphum aceris is described by Stroyan (1977) as 'local' in Britain, and we have only found it two or three times. It is certainly much less common per unit leaf-area of field maple than Drepanosiphum platanoidis is per unit area of sycamore - despite both aphid species being similar in size. This does not appear to support the suggestion of Gaston & Lawton's (1988) that similarly sized species should show the same general level of abundance since they have similar per-capita resource requirements. 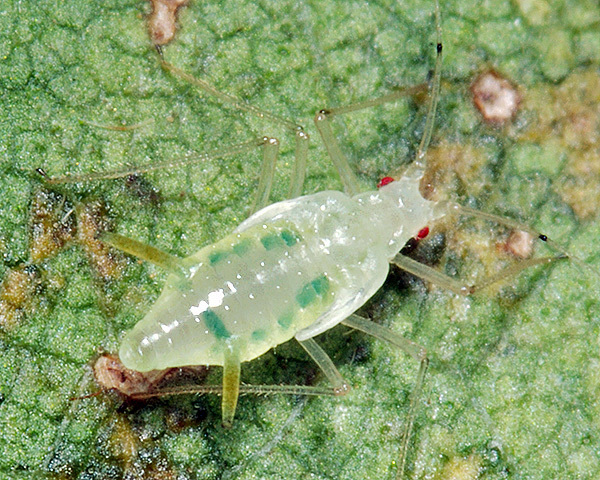 Dixon & Kindlmann (1990) suggest that abundance of different aphid species depends more on the abundance of their hosts. However, at least in East Sussex, field maple and sycamore are similarly abundant - so this also does not explain why Drepanosiphum platanoidis is so much commoner than Drepanosiphum aceris. Drepanosiphum aceris has been tentatively recorded on a number Acer species, but the only confirmed findings are from Acer campestre. 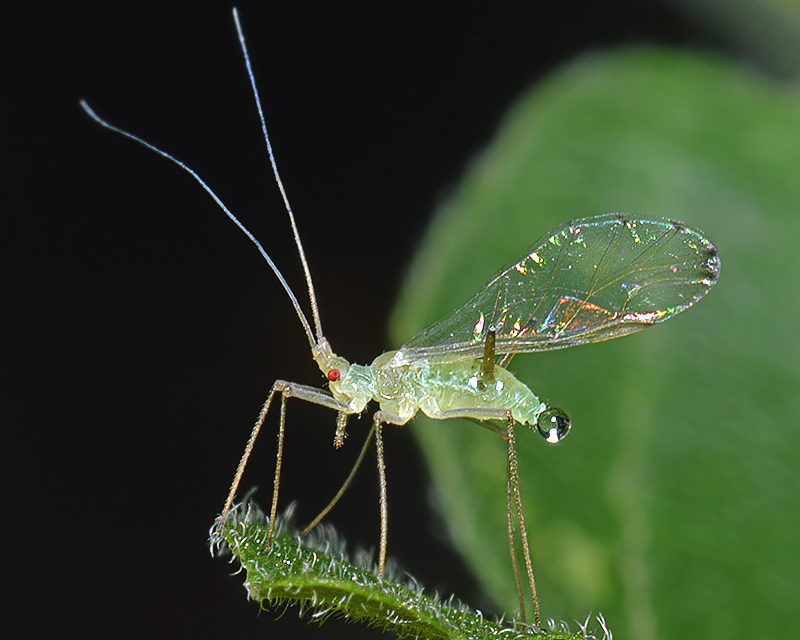 Of those aphid species, Baker (2015) lists 17 as occurring in Britain: Aphis craccivora, Aphis fabae, Aulacorthum solani, Drepanosiphum acerinum, Drepanosiphum aceris, Drepanosiphum dixoni, Drepanosiphum platanoidis, Mimeuria ulmiphila, Periphyllus acericola, Periphyllus aceris, Periphyllus californiensis, Periphyllus hirticornis, Periphyllus obscurus, Periphyllus testudinaceus, Stomaphis graffii and Stomaphis longirostris. 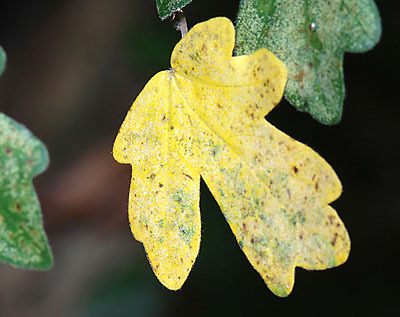 In autumn Drepanosiphum aceris colonies do seem to occur most often on prematurely yellowing leaves, although whether they are selecting such leaves for nutritional benefits - or causing the yellowing by their feeding activities - is unclear. Field maple is widely grown as an ornamental tree in parks, and the wood is of good quality, but its small size and slow growth means the tree has little commercial value. 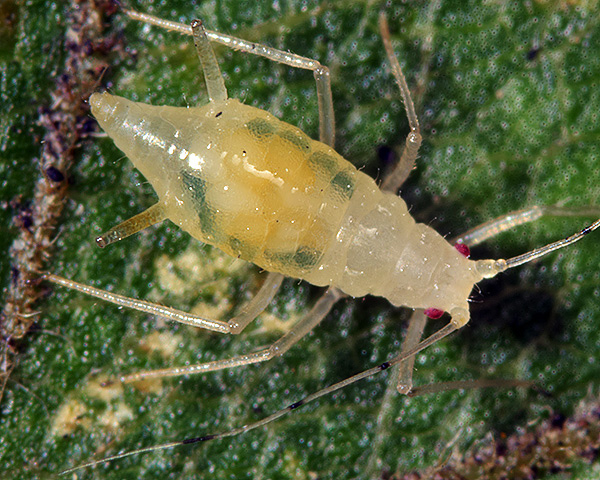 Hence one cannot consider the scarce maple aphid as a pest, especially since it is usually quite uncommon. Stroyan, H.L.G. (1977). Homoptera: Aphidoidea (Part) - Chaitophoridae and Callaphidae. Handbooks for the identification of British insects. 2(4a) Royal Entomological Society of London. Wiackowski, S.K. et al. (2001). Parazytoidy mszyc (Hymenoptera: Aphidiidae) Polski centralnej i poludniowej (Aphid parasitoids (Hymenoptera: Aphidiidae) of Central and Southern Poland). Wiad. entomol. 20(1-2), 57-65.